On November 11, 2012 I received an unusual comment on one of my blogs from Antonio Bonache. Antonio and Yolanda found me while they were fishing the internet for news and photos regarding their soon to be adopted son from Mali, Africa. This was not the first time a would be parent had contacted me regarding a child under the care of the Orphelinat Niaber. I was deeply touched by their relentless questions. They asked me what it was like to hold their son, Tidiane. They wanted to know what his needs were and if he had any special requirements. They wanted to know any and everything they could about their son. And yes, he was their son already although they had never met and Tidiane lived miles away at the Orphelinat Niaber. The doting father and mother were anxiously awaiting the day they would fly to Bamako, Mali and meet their son for the very first time. In preparation they readied his room, bought clothes, baby bottles and an arsenal of baby accoutrements for little Tidiane. As the time drew nearer for their departure date, the war in Mali was escalating. To make matters worse, the government of Mali decided to follow Russia’s lead and put a ban on foreigners from being able to adopt Malian orphans. People were leaving Mali in a max exodus. Undeterred, the brave couple boarded their flight for Mali on January 2, 2013. 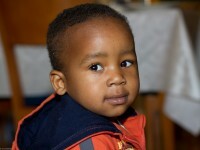 On January 3 they finally received the long awaited custody of their beloved son, Tidiane. In Antonio’s own words his days in Mali were the most intense time of his life. The Bonache family did not return home to Spain until January 6. Fast forward 2 months later. Baby Tidiane, Papi Antonio and Mami Yolanda are in seventh heaven. Tidiane is a bright, happy-go-lucky toddler who hungers for knowledge. A fairytale ending for a fairtale family who bravely embraced the odyssey of adoption that took them miles away from the comfort of their home in Spain. May more childless couples step forward and open their arms, hearts and their homes to the world’s children in need. Tina Cornely is a long standing humanitarian and environmental activist. She is the former Director of Technology of the Solomon R. Guggenheim Museum in New York and the former Director of Operations at the Miami Art Museum in Miami, Florida. Ms. Cornely believes that art is healing and revealing. In her own words, we can express with art what we cannot express with words. When we use art to teach others, we help increase their critical thinking skills exponentially. Art can also be a means to generate a revenue source. And when you make art out of trash, everyone benefits. Will quantum computing level the playing field for humanity?